Do you know what My Weather Radar is? If you are looking for an app that could help you keep up with the latest weather forecast, you should choose something other than My Weather Radar. This extension might seem quite useful and reliable, but, unfortunately, it functions as a browser hijacker, and while it can provide you with access to websites that reveal weather-related information, it primarily works as a tool that is meant to introduce users to an unreliable search engine. Interacting with this search engine could be dangerous, and that is why our research team recommends deleting My Weather Radar along with the hijacker that it exposes users to. If you are not sure what we are talking about, continue reading this report. If you wish to remove the PUP (potentially unwanted program) as soon as possible, scroll down until you find a guide that shows how to eliminate it whether you use Chrome, Firefox, or Internet Explorer web browser. While different Polarity Technologies hijackers represent different third-party links – the one discussed in this report routes to weather-related sites – they all have one thing in common, and that is the search tool. It looks quite normal at first, but when you enter a search keyword and hit the Search button or Enter, you find yourself rerouted to Yahoo Search (search.yahoo.com). Well, Yahoo is reliable, right? It is, but the hijacker can modify the results, and they might include unreliable sponsored content and unrelated links. Considering that the creator of My Weather Radar can employ data-trackers to spy on users and even record personal information, it is likely that the sponsored links would be added based on the collected data. That does not make them any less suspicious and unpredictable. Overall, our research team believes that it is best to remove My Weather Radar because the search tool it offers – which is its main feature – does not offer reliable services. 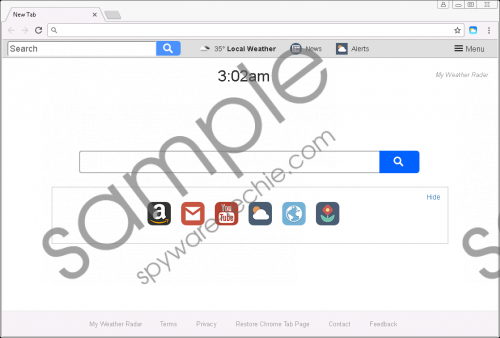 Now that you have decided to remove My Weather Radar, you need to figure out the best way to get rid of it along with the browser hijacker. Before you make the decision, we recommend installing a malware scanner to check if anything else on your operating system requires attention. Obviously, if you are informed about malware that you cannot erase yourself, it is wise to install a legitimate anti-malware tool. It will automatically delete My Weather Radar along with everything else that is malicious or unreliable. What if you want to take care of the removal yourself? If that is the situation, follow the guide below to erase the PUP and the hijacker from your browser. Uninstall/Remove the undesirable application (SpringTech Ltd. should be listed as the publisher). Open the browser, tap keys Alt+T, and select Internet options. Click the General tab and then overwrite the undesirable URL under Home Page. Click OK, tap Alt+T one more time, and then choose Manage Add-ons. In the Search Providers menu set the desired provider and Remove the hijacker. Click Done. In the Chrome menu on the right click More tools and then Extensions. Click the trash bin icon next to the unwanted extension and then select Remove. In the Tools menu at the top click Add-ons to access the Extensions menu. Identify the unwanted extension and then click the Remove button on its right. Whether you installed My Weather Radar with intention or unknowingly, you need to delete this PUP as soon as possible. As long as it is active, data-tracking technologies will allow the creator and unknown third parties to record information about you. This information could be used to introduce you to more attractive advertisements and offers via the search tool. Although the PUP redirects searches to Yahoo Search, the results can be modified, and interacting with them can be dangerous. As you can see, there are several reasons to remove My Weather Radar from your browsers. Use the instructions shown above if you want to erase this PUP and the hijacker manually, or install an anti-malware program if you need a tool that can automatically erase all existing threats and PUPs at once. Tags: delete My Weather Radar, My Weather Radar, remove My Weather Radar.